In a lengthy post early this year, Mark Zuckerberg announced how he would be changing up Facebook’s news feed algorithm again and started a rush of panicked meetings by digital marketing teams across the globe. Once again, Zuckerberg has adjusted his platform in such a way that brands and businesses are going to find it even harder to reach their target audience than ever before. Everyone in the world of digital marketing will remember the earth shifting algorithm change that hit Facebook in late 2016. Both Facebook and Instagram limited businesses reach to just 30% of their following on average, and did away with the chronological news feed we had all come to know and love. And, it is safe to say, people were NOT happy. They were now having to sift through old posts to find out what was actually happening in their friend’s lives, and missing important information thanks to Facebook not deeming it worthy enough to sit at the top of their feed. Marketers too were annoyed, as their carefully crafted posting schedules no longer had quite the same effect as they once had, now that Facebook might not even show their post to their followers until much later in the day (or week). Before this change, social media marketing was a very different landscape. It was practically the promised land. Free promotion that was easily seen by hundreds and thousands of people was on offer, and a platform that would share your content to the masses, whether it was text, photos, links, or videos that you wanted to be seen. But, once all that changed, marketers had to get smarter. Reach dropped suddenly for their pages, and their organic content was no longer delivering the results it was before. Promoting posts became more popular, and influencer marketing sparked more than a little interest on Facebook now, too. The landscape of social media marketing had changed significantly. Even more so than before, the platform is shifting its focus away from business pages and giving more airtime to individuals and personal connections. Pages will see their already struggling reach statistics drop even lower, unless they change up their strategies once again. Remember the good old days of Facebook when all you really saw were pictures of your aunt’s last holiday, and updates on your friend’s new baby? Well, it seems that Zuckerberg has a touch of nostalgia, as he tries to steer the platform back to it’s slightly annoying, but very personal, roots. One of the main reasons for this shift is the rising world of “fake news” and how it is constantly plaguing our personal news feeds. It’s long been known that anyone can post anything they want online, but as these kind of “news” stories keep gaining traction, they have been fuelling much bigger issues than ever before. By limiting the organic reach of pages, and prioritising personal pages, Zuckerberg hopes that this will help to filter out a lot of that noise for its users. So hopefully we’ll hear less about how Texas is actually a part of Mexico, pardoned turkeys being killed on Thanksgiving, and Radiohead getting confused when their audience started clapping - shame. Facebook is still the Godfather of all social media with over 2 billion monthly users currently active worldwide, so this change is definitely going to affect the majority of social media marketing departments out there. Thomas Drew, Social Media Strategist at BLKBOX said recently “I expect more paid ads, less organic posts from brands, and more influencer marketing partnerships with mega, micro, and nano influencers”. So, while this may be a kick in the teeth for many marketers, those that have been leveraging the power of influencer marketing for some time will be able to smirk behind their stats a little longer. The new focus on personal content means that business pages are going to see another huge drop in reach this year. It would seem that if brands are wanting to promote their own products on Facebook, then organic posts just aren’t going to cut it anymore. While some of the bigger names on Facebook will already be highly proficient with sponsorships and promoted posts, even smaller names will need to read up on this if they want to get ahead. It’s no longer enough to simply post good content and hope that it will get seen. Zuckerberg even mentions that the love affair the platform was having with video content is coming to an end as well. So cancel that video editing course you signed up for, and start delving deep into the world of Facebook advertising instead. As we’ve mentioned, the need for investing in promoted content has never been higher than it is right now. If your brand didn’t start strategising in this area after the last algorithm change, you might end up falling behind in a drastic way. Learning how to effectively utilise Facebook’s inbuilt post promotion tools will soon be part of the essential framework for any social media marketing campaign. We’ll go into this in more detail later in the article. But, take it from us, content isn’t king anymore - at least not in the way it was before. That crown has been passed down to it’s more expensive successor - sponsored content. Even more so than before, the power that influencers hold on Facebook will rise exponentially. Right from the start, influencers have always been people first, and brand ambassadors second. And, with these changes to how users will see content on their news feed, the necessity for influencer marketing will skyrocket. No matter what niche an influencer is in, they will have developed a style of content and communication that resonates with their followers. They are creating the kind of meaningful conversations that Zuckerberg is so crazy about. Their ability to reach their followers will continue to grow under this new regime, and if you’re not already utilising them, you’re going to be left behind in the dust. Since the first algorithm change in 2016, the popularity of influencer marketing has been going from strength to strength. Influencers offer businesses a way to reach not only their current audience, but also a whole new one among the influencer’s followers themselves. Now that organic reach for businesses is dropping, finding these new followers is only going to be possible by investing real capital into their social media marketing campaigns. The choice though, lies in whether to invest this capital in promoted posts, or influencer marketing (or both - but we’ll get to that later). One of the reasons that influencer marketing has been so successful in the past is the genuine connection they hold with their followers. Their community is fully invested in their opinions and what they have to say - they trust them. It is this superpower that is going to propel their value throughout this algorithm change. They are able to offer brands something that they simply cannot do on their own - reach and engage with people through Facebook. Just take a look at this live video posted by an influencer called Laura Clery from when she was working to promote a new game. The video received nearly 500k views and encouraged over 8k people to interact with it - pretty impressive. While influencers may be expert content marketers and brands in their own right - they have always been, and will always be, people first. Because of this, their reach will not be affected in the same way that businesses will, and they won’t be hit as hard by the algorithm change. Facebook is putting even more emphasis on engagement now, and posts that foster and build some kind of discussion are going to shoot up people’s news feeds like no-ones business. Using an influencer to spark these conversations about YOUR brand is how you’re going to get your product seen in the new age of Facebook. The algorithm will also start recommending content it thinks it’s users will like, and these recommendations will be based on the engagement levels of posts. Having a partnership with a successful influencer will therefore give your post a better chance at being picked by the algorithm and getting seen by more people. We’ve touched already on the fact that Facebook is no longer a free platform for businesses to grow their brand on - and honestly, it’s been going this way for years now. At the end of the day, Facebook is a business too, and they get their revenue from brands who invest in ads and post promotion. So, if they want to encourage more brands to invest so they can up their own revenue, all they have to do is limit how far businesses can grow organically on the platform. A boosted post is created in the same way as any other post a page might put out on Facebook. The difference though, is that you then invest some money so that Facebook will show the post to more people for you. There are a range of metrics you can include to help make your money go further. The platform currently offers different types of promoted posts that can help you achieve more website visits, post engagements, or page likes. You can also select your desired target audience using categories such as age, gender, location, and interests. Have you ever seen an ad on Facebook that freaked you out because you were SURE the Z-man must have been spying on you?! This is a perfect example of a brand really using their targeting metrics to full effect. In the same way that you wouldn’t partner with a 17-year-old influencer to market anti-aging products, you need to make sure your promotion audience targeting is on point. Before the algorithm change, this section would have read very differently. I would have advised that everyone should at least try promoting a post to see what kind of reaction they got. Now, it’s all but essential if you’re looking to grow your presence on Facebook. The art of boosting posts and running ads on Facebook would take a whole other article (at least) to really get into the nitty-gritty details of an effective strategy. But let’s take a look at the main points to consider for now. How much capital do you have to invest in your social media strategy? If your budget is more limited, running a dedicated Facebook ad may well be out of reach for you. Promoting one of your posts is a much more cost-effective option. Is your post good enough? No matter how much money you pump into promotions on Facebook, if your content isn’t top-level, ground-breaking, engagement inducing magic; it may well be a bigger drain on your resources than you might think. This is where utilising influencers, and their skill for content creation will really come in handy. Is Facebook where your audience is engaging with brands? Really consider if Facebook is where your target market is spending most of their time. Depending on your brand, content, and following, you might be much better off investing your cash in promoting content on Instagram, Twitter, or YouTube. This is by no means an exhaustive list of considerations you must bear in mind, but it should give you some food for thought. We’d also recommend reading more about this here, here, and here to get a better understanding of how the process works. One tactic that can dramatically increase your ROI is to use both influencer marketing and promoted posts in conjunction with one another. Since mid-2017, Facebook made the process of boosting an influencers post even easier for brands. Making a move like this so close to their big algorithm change tells us that the platform is really trying to encourage the growth of influencer marketing on Facebook - at least for now, anyways. You may be thinking that if you’re already investing your money in an influencer marketing campaign, why should you then invest even more to promote their post? Well, the simple truth is that your own page is no longer going to be bringing in the leads that you need - whereas influencers posts will. 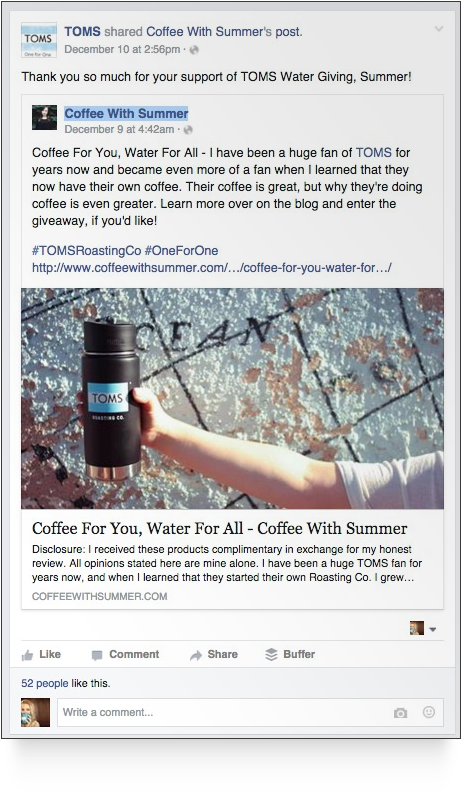 By promoting their posts, you’re getting their genuine, engaging content out to an even larger audience than before. You’ll be utilising their own network of followers, as well as people who haven’t discovered them, or your brand, yet. And, while influencers won’t see as dramatic a drop as businesses will in terms of reach and engagement, there will still be some changes. Boosting an influencers post will help to remedy this, and keep your campaign going strong. In this new era of pay-to-play marketing on Facebook, brands can no longer afford to be tight with their budgets. In the past, the only way to boost an influencers post was to first share it on your own brand page, and then promote your own post. While this wasn’t exactly difficult to do, it did result in a rather clunky looking post, as you can see in the example below. But, due to the changes brought in mid-2017, this whole process has now been streamlined. Influencers can now tag the brands they are partnered with in their posts, and give those brands permission to boost their post directly. No more sharing needed. The influencer simply has to tick a box, and away you go. Facebook was first launched 14 years ago, (anyone else feel old now?) and it has seen more change in the last two years than in the rest of the platform’s life combined. We would be incredibly naive to think that there won’t be more changes on the horizon for this social media Megatron. But, what those changes will be remains a mystery, even to the most in-the-know digital marketers out there. The best we can do is speculate. But, even those speculations seem to be spelling out trouble for social media marketing campaigns as the platform, and those related to it, continue to box marketers into a very expensive corner. Despite influencer marketing currently being the golden child of marketing on Facebook, there’s a good chance that the platform may eventually place more regulations on how influencers operate, and how many people see their posts. If Zuckerberg is implementing all these changes in the hopes of stopping “fake news” in its tracks, and bringing more personal, and less branded content, then will influencers be next in line to feel the sting of lowered reach? Where will they draw the line on what constitutes “personal content”? If this is the case, marketers will be finding themselves investing even more money into their campaigns, or just maybe, they’ll start shifting their focus away from the platform altogether. As we all know, Instagram has always been hot on the heels of it’s big social media brother, and these recent changes won’t be any different. Already, business accounts have seen a drop in their organic reach compared to personal accounts, and sponsored content is creeping more and more into people’s news feeds. But, as the real powerhouse home of influencer marketing, what kind of effect will changes on this platform have on the industry as a whole? If Instagram starts to restrict business accounts in the same they’re restricting pages on Facebook - even influencers may begin to struggle to really get their voice heard. Which is - you’ve guessed it - bad news for marketing teams, and their budgets. As digital marketers, we all need to keep our ears to the ground, and keep pushing the envelope with our strategies. For now at least, it seems pretty clear that influencer marketing is an investment worth making when it comes to Facebook. If you’re looking to delve into your own influencer marketing campaign, get in touch with us today, and we can help you find the best voices to shout about your brand online. Do you want to work with influencers in 2018? The Shelf is an influencer marketing company that designs and implements the highest performing campaigns in the lifestyle space (fashion, beauty, mommy, food, travel, home, DIY, health, and fitness). Sign up for a demo to get your custom proposal.